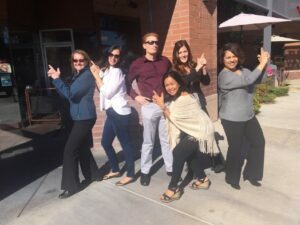 The Fearless Presentations® public speaking course in Phoenix, Arizona, brought together participants from very different professions, ranging from government agencies, to health and wellness products, to the tourism industry. Most of the participants in this class experience some degree of public speaking fear, which is very common. By immediately practicing the techniques taught in front of the group, each participant is able to truly own and master the techniques covered in the class. A common outcome of the class is that participants realize a high percentage of the nervousness they feel is not visible to the audience. By setting up a safe and supportive atmosphere, participants are welcome to experiment with the various techniques to see what works best for them. This class was unusual in that all of the participants were women! They decided to have a little fun with a "Charlie's Angels" class photo with instructor Chris McNeany .